DENVER (July 7, 2015) – Baceline Investments, LLC, a boutique private equity real estate investment and management company with retail holdings throughout the Central United States, announced today the largest real estate transaction in the history of the firm. Baceline has acquired a portfolio of 10 neighborhood retail centers, totaling approximately 418,000 square feet, located throughout the Midwest and South Central part of the United States for $33,285,000. The portfolio will be part of Baceline’s High-Yield Income Strategy, designed to produce substantial income through the ownership of stable cash flowing commercial real estate. Baceline’s High-Yield Income Strategy, launched earlier this year with the acquisition of Westgate Shopping Center in Little Rock, Ark., is one of three investment vehicles sponsored by the firm. The other strategies Baceline specializes in include the Debt Free Income and Opportunistic strategies. 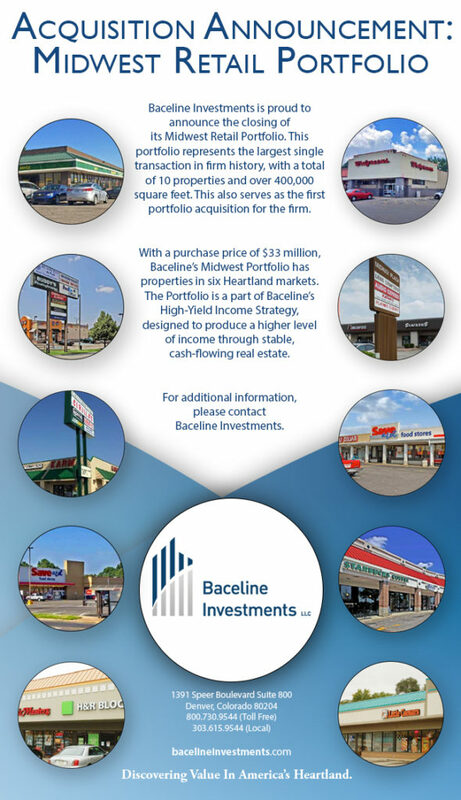 Founded in 2003, Baceline Investments, LLC is a Denver-based privately held boutique real estate investment and management company that specializes in the acquisition, management, and sale of necessity-based shopping centers in select secondary markets across America’s Heartland. This unique geographic focus allows investors to better diversify their investment portfolio while avoiding exposure to overly competitive larger markets and more cyclical coastal regions.